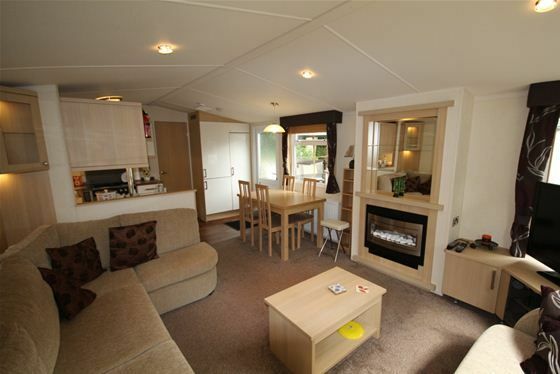 This 3 year old caravan is fully equipped for 6 people, babies and small children. It is warm and cosy throughout the year, with central heating and a log effect fire. We are a real home from home, with all new equipment and bed linen. 42' Smart TV and DVD, free Wifi, Lockable decking area with 6 seater dining table and chairs. Bikes if required. We are 5 minutes walk from the Clubhouse and, playgrounds tennis courts and swimming pools. Entertainment in the club every night in the season (14th March to 1st November, I can arrange club passes which cost £13 per adult and £8 per child for 4 nights in high season, less in low season. These passes must be ordered by me, and must also be paid to me separately from the rental. Childrens team with Sammy Seahorse. My husband and I although retired from running our own businesses, seem to have got involved in another! We have 5 holiday homes...2 static caravans, a lakeside lodge a mile up the of these in the Cotswold Water Park. We also have 2 apartments in Marbella. We love the Hoburne Holiday Park, so perfect for our small grandchildren. They love the indoor pool, but there is so much more when you use the whole site. Our 3 year old granddaughter loved swimming in the pool, so we bought a caravan so we could come whenever we caravan was only 2 years old and well looked after, we fully equipped it for us as a family. So everything, duvets, pillows, bed linen, tv is all brand new last Spring...The problem is so popular for renters, we had to buy another! SO sorry about the coffee maker...the renter before jammed it, and we haven't bought a new one yet.....will get to that immediately. We would love you to return, although the park is closed in December, sorry..
Fine destination, clean and comfortable mobilhome. Spacious bathroom. Very good kitchen area. We missed, in the UK, a teapot! Good place to stay and see the marvelous Cotswolds. Oh dear....no teapot.....I will get one tomorrow. And we really thought we had everything. So pleased you enjoyed your stay in our caravan in the Cotswold Water Park. Les prestations du Mobilhome sont largement au dessus de ce que l'on peut trouver en France. Le camping est très agréable avec beaucoup d'espaces verts et de vrais services de qualité. Excellente base pour visiter les Costwold ou prendre du bon temps. Sehr schöne und gemütliche Unterkunft. Sehr sauber und gut ausgestattet. Einkaufsladen und Schwimmbad am Platz haben uns gut gefallen. Hatten sehr schöne Urlaubstage und haben besonders die große Terrasse genossen.